Built in 2015, an immaculately presented five bedroom family home situated just outside of Buckingham town centre, walking distance to the Royal Latin Grammar School. The property benefits from four reception rooms, two ensuites, a double garage, driveway to the front of the garage and a south west facing rear garden. The accommodation fully comprises: Reception hall with storage, utility/cloakroom, sitting room with Bifold doors to the rear garden, kitchen/dining/family room with various integrated kitchen appliances and French doors leading to the rear garden, dining room/playroom and study. 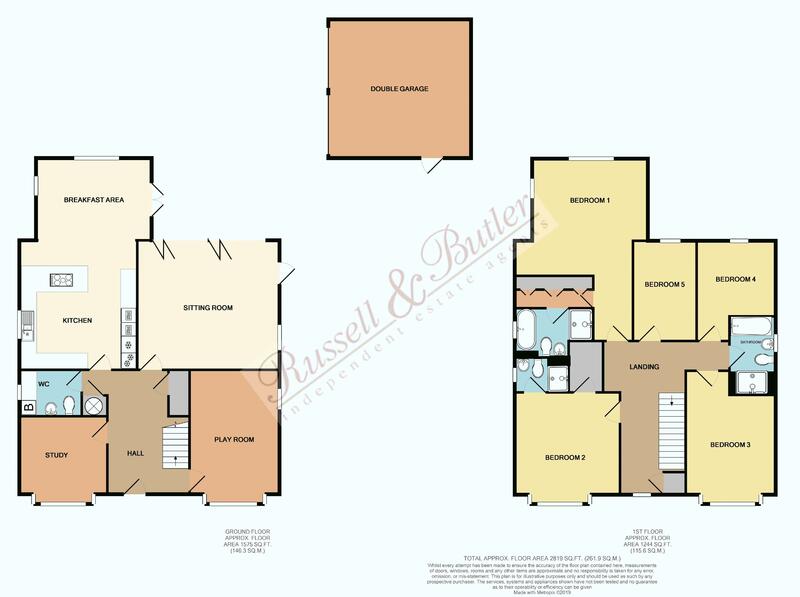 To the first floor; Spacious landing with storage, master bedroom with walk in dressing area and built in wardrobes and ensuite, bedroom two with walk in wardrobe and ensuite, three further bedrooms and a family bathroom. To the outside: Double garage with electric doors, driveway and landscaping to front and side aspects and to the rear including artificial grass. Quality fitted blinds throughout, EPC rating B.
Cupboard housing hot water tank, under stairs storage cupboard, Karndean flooring, radiator, stairs rising to first floor. A range of base units, work tops over, integrated washing machine, cupboard housing boiler serving both domestic hot water and gas to radiator central heating, tiled floor, radiator, Upvc double glazed window to side aspect. White suite of low level w/c, sink unit with mono bloc mixer taps, tiling to splash areas. Upvc double glazed 'Bifold' doors to rear, two radiators, Upvc double glazed window to side aspect. A range of base and eye level units, stainless steel one and a quarter sink unit with mono bloc mixer tap, cupboard under, work tops over, tiling to splash areas, two integrated ovens, five ring gas hob, extractor hood over, integrated dishwasher, integrated tall fridge, integrated tall freezer, tiled floor, down lighters, three radiators, two Upvc double glazed windows to side aspect, Upvc double glazed French doors to rear garden, Upvc double glazed window to rear aspect. Three Upvc double glazed windows to side aspect, Upvc double glazed window to front aspect, radiator. Upvc double glazed window to front aspect, two Upvc double glazed windows to side aspect, radiator. Walk in storage cupboard, radiator, Upvc double glazed window to front aspect. Master Bedroom - Upvc double glazed windows to side and rear aspect, radiator. Walk in Dressing Room - A range of built in wardrobes with rails and shelving as fitted, built in cupboards. Fully tiled double width walk in shower, bath with mono bloc mixer tap and shower attachment, low level w/c, sink unit with mono bloc mixer tap, tiling to splash areas, tiled floor, shaver point, heated towel rail, down lighters, Upvc double glazed window to side aspect. Walk in dressing room, two Upvc double glazed windows to side aspect, Upvc double glazed window to front aspect, radiator. Fully tiled double width walk in shower, white suite of low level w/c, sink unit with mono bloc mixer tap, tiling to splash areas, tiled floor, shaver point, down lighters, radiator, Upvc double glazed window to side aspect. Fully tiled double width walk in shower, white suite of bath with mono bloc mixer tap and shower attachment, low level w/c, sink unit with mono bloc mixer tap, tiling to splash areas, tiled floor, heated towel rail, shaver point, Upvc double glazed window to side aspect. Landscaping to the front and side including paved and gravel areas, outside light. A fully enclosed landscaped rear garden with artificial grass, paved patio areas, graveled areas, storage shed, outside power and outside tap, gate leading to driveway. Power and light connected, electric doors, pedestrian door to garden.